The olfactory nerves are composed of axons that arise directly from the olfactory sensory cells located in the nasal pits of the nasal epithelium. These axons traverse a short distance to the olfactory bulbs located in the telencephalon of the brain. By stages 33 to 37, the nasal epithelia are fully determined. 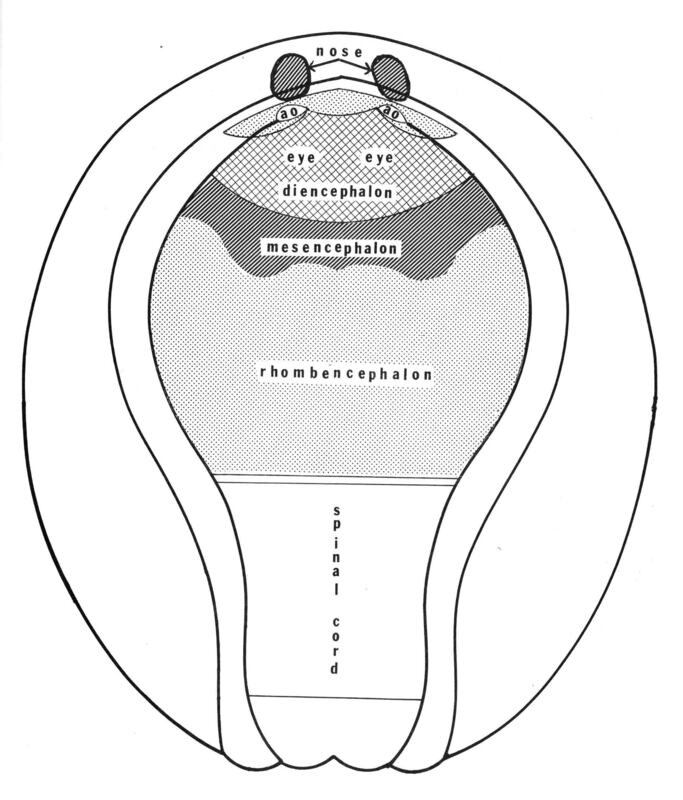 Emerging axons follow the curve of the surface of the nasal pit to three sites opposite the telencephalon. They then extend away from the nasal pit at right angles to the pit surface and continue extending straight without regard to how the pit is experimentally misoriented. The outgrowing axons will even graze the surface of the telencephalon and not deflect into it. The axons get their direction from the orientation of the nasal pit and normally are directed straight to the telencephalon because induction and morphogenetic movements put brain and pit in proper relationship to one another.